No doubt you've heard plenty about LED lighting and what it can do to save energy and money. If you've considered it for the interior of your industrial facility, what about outdoor areas as well? Considering your facility may operate 24/7 now, your parking areas should have strong consideration in the kind of lighting you're using. On an aesthetic and safety level, LED lights are going to do more than you think in your parking lot. Take a look at how LED lights make a difference. What Kind of Lights Are You Using Outdoors Now? If you're like many other similar facilities, you probably relied on incandescent lights for many years. Later, you likely switched to CFL (fluorescent tubes) to light your parking lot. These are perhaps the lights you're still using because they were the most economical at one time. Yet, did you know CFL's don't last nearly as long as LED lights do? A decade ago, CFL's were considered a new standard because they lasted a reasonably long time and were affordable. LED's were considered too expensive back then, though things have changed considerably. Now LED's are more affordable, giving you more of an incentive to use LED's since they'll last two to four times longer than CFL's. Considering your facility may operate into the late hours, it's going to mean that many workers are either arriving or leaving work when it's dark. It becomes a major risk having your workers parking their cars and walking across the lot when it's pitch black. Even if you do have some lighting, it's perhaps too dim to light up the entire area. 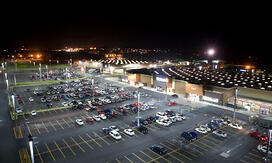 LED lights are more directional, ultimately providing more light across your parking lot overall. The more of them you use, the more it's going to feel like it's still daytime. This is going to help your employees in more ways than one. The last thing you want is one of your employees tripping and falling in your parking lot. A fall there could become more serious than you think, including potential lawsuits from breaking a leg or hip. It's all the more reason LED lights are so important to light up areas frequented by people during the nighttime hours. Everything from potholes to curbs are going to become more visible. Keep in mind this works just as well in a parking garage if you have one near your facility. Remember to also use LED lights along stairs. No doubt you have these somewhere around your parking area, including in front of your facility's entrance. Smaller LED lights are easy to install so they highlight each step in precarious places. Many studies show the use of LED lighting is a great crime deterrent. In a parking lot, this is extremely important since dark areas could hide someone unafraid to attack one of your employees. Muggings could occur, or even worse crimes if you don't have proper lighting outside. If you happen to have security cameras in your parking lot, bright LED lighting will help capture any incident occurring with more clarity. Where Can You Find LED Lighting for Your Industrial Facility? Here at Lighting Services, Inc., we have a long history of providing the most innovative lighting to the industrial sector in eleven east coast states. With 84 years of experience, we have a trained staff ready to install your LED lighting at a time of your choosing. Contact us to learn more about our comprehensive lighting services, including emergency lighting and on-call electrical repairs.